I constantly encourage friends, readers and fans to get playful with their look and try new things. But I don't practice what I preach. And I have every makeup product in the world at my fingertips. So there's no excuse not to play around. Most women are reluctant to splurge on bold colors they might wind up tossing, so I get the hesitation. That's why I love e.l.f. Cosmetics. Most of the products are under $4. You can fill a shopping cart for less than the cost of one prestige lipstick -- and create dozens of look without beauty buyer's remorse. e.l.f. asked me to collaborate on a #PlayBeautifully campaign to get women to experiment with new color combinations, products and looks. I was so psyched to have a good reason to test bold purple smokies. Now I had permission to go all out with false lashes. It was my ticket to check things off my beauty bucket list. I went through hundreds of cotton pads, Q-tips and makeup wipes. But came out feeling empowered to try new things more often. It was my ticket to check things off my beauty bucket list. e.l.f. Studio Complexion Brush Brush This is a great brush for my several-time-a-day bronzer application. The synthetic bristles are made with antibacterial Taklon. But the brush is remarkably soft, not spiky like other synthetic brushes. The silky smooth texture of this powder is blendable and never looks muddy or dirty on my skin. Formulas with too much pigment look streaky and unnatural on me. It's also spiked with vitamin E to help nourish the skin. This balm gives a flush of coral to lips. It also hydrates with a blend of coconut, shea butter and rice extract. 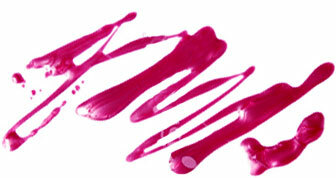 You can smear on with a finger or go for a more polished, precise look with a brush. I have big lips, so bold colors intimidate me. If I accidentally paint outside my lips, it will look clownish. This teeny brush helped me target the color along the lip line -- and I used another one to draw concealer along the outside my lip line, creating the most distinct, polished lips. Ever! I never would have known what to do with a purple gel primer. The concept of a color wheel and neutralizing tones never made sense to me. But this lavender immediately disappears on the surface of the skin, yet manages to brighten the complexion and make skin look refreshed. It's like a minor tweak or Instagram filter to wake up your face and bring skin to life. This new antibacterial, synthetic haired Taklon brush is softer and more absorbent and can be used with wet or dry products. The layered bristles create a soft airbrushed look that's perfect for applying foundation or adding color definition to cheekbones or highlighting with soft layers. Use this brush with any liquid or powder face product such as foundation, blush or bronzer to build your coverage from sheer to heavy. e.l.f. Eyeshadow C Brush This brush get right into the crease of the eyelid, so you don't wind up depositing color all over the lid. The deeper "emphasis" shade can peek out when you blink your eyes. I focused on the lower lashline, which was a big trend on Fall 2015 runways. After playing around a few times, I found some really cool ways to wear this shadow. To get a violet glow below my lower lashline, I wet the brush and swept it through the powder, creating a more intensely pigmented hue that looked concentrated and vibrant. The tight bristles help the powder in place, so I didn't get falling flecks everywhere. It just lit up my eyes from below. I've always been confused by fan brushes. Do they actually pick up any powder? And how do you apply something with them? It turns out that the unique shape blends away makeup mistakes pretty nicely. It's great to have on hard for experimenting, because a dark blush can be hard to tone down. But a few swipes softens and blends out the shade. So silky and blendable. It's completely klutz-proof, especially with the fan brush. I chose this golden primer, Radiant Glow, to see if I could give my a fresh glowy look. I didn't want my skin to look sweaty or glittery, but the shimmer level is subtle. And when other products are layered over it, you really do get a "lit from within" look. It also camouflaged my dark spots and uneven areas. This was a great brush for spreading the product over my face. The angled end helped apply product in hard-to-reach places, like around my nose. Contest: What's On Your Beauty Bucket List? Is there a winged liner or gradient lip that you've wanted to try? My guess is yes. I know you guys like a challenge, and I love giving away irresistible prizes. 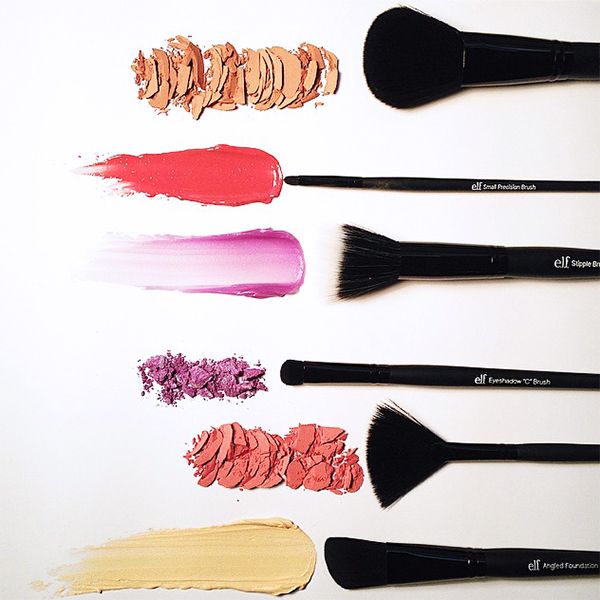 So here's the deal: Post an Instagram photo of your new look with the hashtag #PlayBeautifully. It could be one feature, your whole face or a few products you used. Two lucky winners will be chosen and announced next week. The prize? A free shopping spree and makeup chest filled with e.l.f. Cosmetics. Can't wait to see what you come up with! This article is part of a paid collaboration with elf Cosmetics. All opinions are my own.